The single-price retailer Poundworld has confirmed that it will open a Poundworld Express store in Redcar this week – only the third store to launch as part of its convenience fascia’s “ongoing trial”. The new store at 80a High Street will open at 10am this Thursday (1 March), and occupies a prominent site on the corner of Moore Street, just outside Redcar’s pedestrianised zone. The arrival is good news for a town that has been working hard to mitigate the effect of empty shops on the High Street, particularly as the unit in question has most recently housed a charity shop – something of a reversal of the usual direction of travel. Fifteen new retail jobs have also been created as a result of the opening. 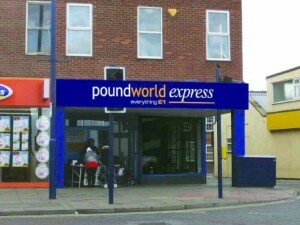 As I noted last week, Poundworld intends its Express format to “help cost-conscious shoppers beat the recession by offering a convenient ‘value’ alternative to other high street retailers”, selling an expanding range of crisps, drinks and groceries alongside Poundworld staples such as cleaning products, toiletries and stationery. The company says that it “plans to roll out multiple high street locations of the new format over the next year”, in addition to 60-plus stores under its Poundworld and Discount UK fascias. In Redcar, Poundworld already has a traditional store further along the street, in premises that previously housed the fashion retailer Etam. However, at just 1,400 sq ft – a tenth of the size of the new Swindon shop – Redcar’s Express store is much more compact than the shops that Poundworld has tended to open in the past. Nevertheless, it still claims to offer “over 1,000 popular products for the purse friendly price of £1” – compared to 5,000 in Swindon – suggesting that clever use of space and effective replenishment will be key as Poundworld continues to refine and roll out its convenience offer.